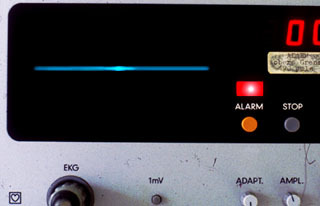 Over the barking voices of nurses and doctors, an EKG machine beeped in a fast staccato, indicating a heart beating way too fast. Nearby, the doctor’s hands raced over a young woman’s broken body as he tried desperately to keep her fading life from slipping away. Bruises covered the young woman’s face. Deep cuts and punctures were visible through the light clothing she wore. Red blood had soaked through her dark T-shirt and was now dripping on the once-pristine tile floor. "She’s going tachy," he announced, "and her blood pressure is cratering. She’s going into hemorrhagic shock; she needs blood and lots of it. We got her typed yet?" He turned to the Asian nurse on his right and was met with a blank look. "Dammit," he muttered. "Get some O-neg, Fitzpatrick. We’ll need at least three units." He turned to the intern standing to his left, "intubate and bag her. No matter what happens, keep her breathing." He turned back to the nurse. "Come on, get that blood!" he snapped frantically. His gaze panned over to the display on the EKG machine, and he let out a long shaky breath. "We’re going to need a crash cart too," he told her, the look on his face resigned. Nurse Fitzpatrick raced from the room and darted down the hallway. As she sprinted towards the far end, she caught a glimpse of another suite. Inside it, the EKG machine next to the bed showed a flatline. She heard the doctor standing over the young woman’s broken body announce, "Time of death, 3:43 A.M." Her jaw clenched, and she shook her head as if she were trying to rattle the image out of her mind. Fitzpatrick darted past a third suite, where another pair of doctors were work ing feverishly to keep a third young woman alive, although even a cursory examination of the young woman’s vitals suggested that she was crashing, and crashing fast. "God, what kind of animal leaves marks like that?" she heard the doctor ask. Directly across the hallway, another doctor was tending to a patient with steady vitals; she wasn’t moving, though. The nurse was working close to the young woman’s feet. "Babinski reflex shows extension," he announced, looking at the doctor. "Whatever did this broke her back." As Fitzpatrick ran around the corner, she deliberately averted her eyes, looking sharply to her right. 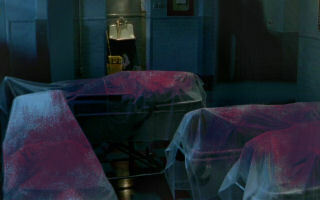 To her left, three bodies lay on nondescript gurneys, waiting to be transported to the morgue in the basement. The white sheets that covered them were soaked through with red. 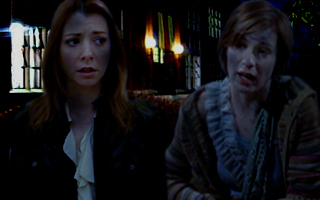 Willow stood next to Vi, her pale skin smeared with dark blood as they stood next to the hospital gurney. Behind them, the lit sign on the front of the building read Vancouver Hospital and Health Sciences Center. 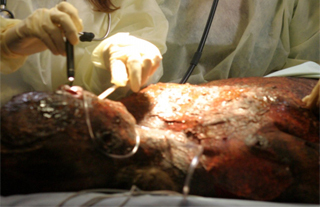 Xander lay on the gurney, his left arm crossed over his chest, meticulously splinted and immobilized. A large bruise was now visible over his left eye and his nose had clearly been bleeding profusely in the very recent past. 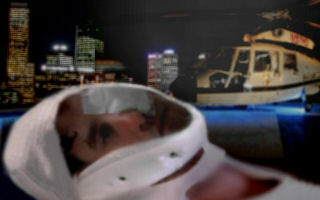 The skids of the helicopter touched down on the concrete pad, and the high-pitched whine of the helicopter’s engine subsided to a faint whistle as the two women pushed the metal hospital bed towards the side door of the whirlybird. The side door bearing the Council’s emblem slid open, and Kennedy hopped out to offer her assistance. She and Vi quickly lifted the heavy bed into the chopper. Kennedy’s brow furrowed with concern, and she bit down on her lower lip as she looked at the man lying unconscious in the bed. Finally, she looked up to meet Willow’s gaze. "Good God, Will," she said, shaking her head. "What the hell happened here?"